Every event starts off small with the hope that it gains notoriety and becomes a yearly event. The Hippy Killer Hoedown started in Kutty and Jamie Noteboom's back yard eight years ago and has grown ever since. Their main goal is for everyone who attends to have a good time. 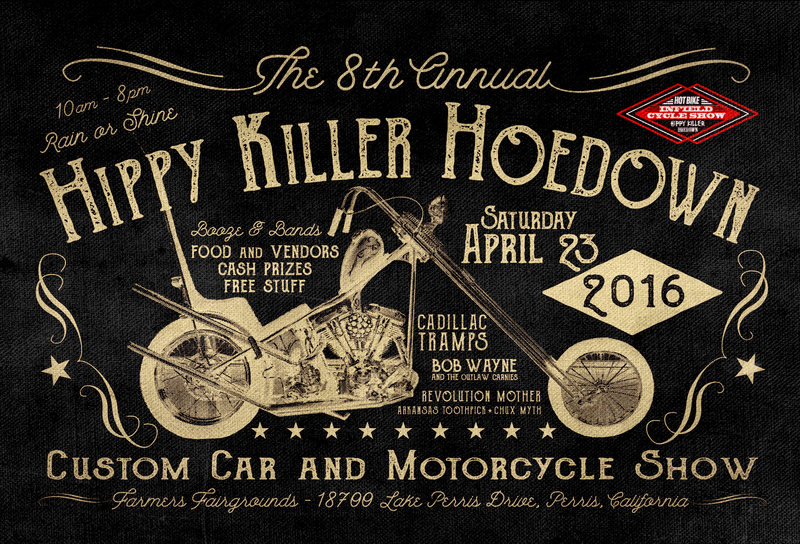 The Hoedown provides a family friendly atmosphere that caters to the car, van, and motorcycle enthusiasts. The Noteboom's hopes are to bring everyone together, offer live music, vendors, and custom awards for a few vehicles on location. In addition, to the Hoedown awards, they have added the Hot Bike Magazine Infield Show. Builders can enter their custom motorcycles for a chance to win a spot as an invited builder on the 2016 Hot Bike Tour. Kutty has secured the Cadillac Tramps, Revolution Mother, Bob Wayne and the Outlaw Carnies, Arkansas Toothpicks and Chux Myth to perform. So, be sure to head to Perris Fairgrounds on April 23, 2016, for a day of fun. Here's a peek of last year's event provided by Twila Knight. Check out the Hippy Killer Hoedown's website and give them a follow on Facebook and Instagram for updates.